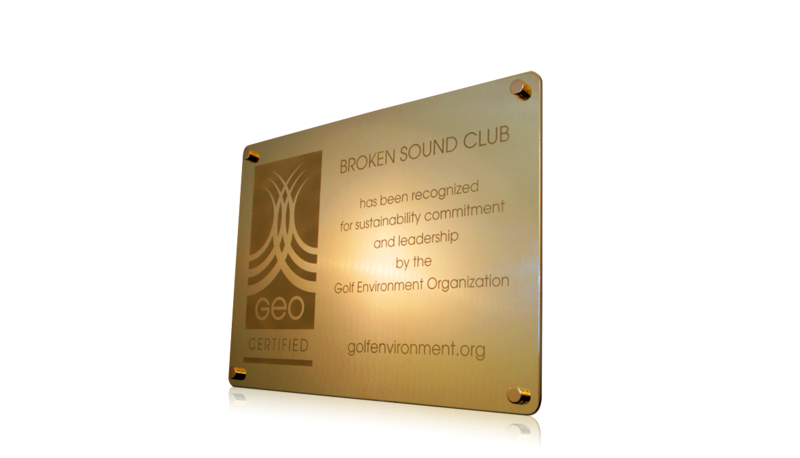 This plaque was designed and made for the Golf Environment Organisation. These large plaques were completed with a premium brass finish, for a unique look. With detailing engraved into the brass, these plaques were personalised with individual golf course location details. Engraving is a flexible and versatile option for any metal plaque. To find out how Gaudio Awards can design and create an award or plaque perfectly tailored to fit your brief, brand, and budget, take a look at our five step ordering process, and get in touch with our sales team. I just wanted to say thank you to you and the team at Gaudio for the National Paralympic Day trophy you produced for us. It really was a lovely piece of work and a very high quality production. The winning team (who I am pleased to say was GB!) were delighted with it! We’ve just received the awards ahead of schedule today! Everyone really likes them, so much so that the R1 controller has just run off with one of them!! They look great, thanks a million. The awards were wonderful and loved by all. Thank you for such an efficient and professional service. The new awards have just been delivered and they look fantastic – we are really, really pleased with them. Thanks again for your help – the customer service has been amazing! Just want to say a massive ‘Thank You’ to you and your team, you have really excelled in our expectation and have been a pleasure to work with. The awards arrived safely and looked great, thank you for your continued support, it is shaping up to be a great night and I am sure the winners will be as pleased as ever to receive their awards. I am really impressed with the work and effort from yourself and the team at Gaudio. It is fantastic that you have taken a massive interest in the development of the new product ranges and I speak on behalf of IIP when I say we thoroughly enjoy working with Gaudio. I highly commend the designs - they are exactly how I'd imagined them, and the quality is impeccable. We are very happy with the overall service we received and we look forward to doing more business with you. We would happily recommend you to anyone who asks! We received the awards today, they look fantastic! You and your team always do such an amazing job. We look forward to working with you all again in 2016. The awards arrived and they are absolutely beautiful! Everyone in the office is impressed as last year! Thank you very much for all your help and please thank everyone at Gaudio who helped to create these amazing awards for us. We will definitely recommend your services and will be booking in the future! We have received the awards and the presentation boxes. They are absolutely marvellous!! I have just finished unpacking and checking the awards, they are beautiful! Thank you so much for making such a great product for us and for being so helpful in the process up to the end product. The quality and value of the plaque speaks volumes and you can quote us on that. I am looking forward to putting it on the wall for all to see. Thank you, really pleased!! REALLY, REALLY. The awards look fantastic, many thanks for your excellent customer service. The service was very prompt, as always, and you always get back to me straight away, which is very much appreciated. I also noticed the details sheet on the front of each award, which means that you can see whose award is enclosed without needing to unwrap each one, which is great! My only feedback is excellent – from start to finish an incredibly polished and professional service. We'll be back again next year for sure! I am very happy with the kind and helpful service and all the information in the process of the production. Thank you very much. The visuals for all of the concepts were significantly better than anything other companies provided us with, so we were confident that the end product would meet our expectations provided you could meet our (rather tight) deadline. The fact that you delivered these in time despite the various delays was both a huge success and relief! We were really impressed with the service that Gaudio provided for us, from the design of the awards themselves to the first rate customer service and the speed of delivery. Thanks to the team for helping to make our night such a success! I just wanted to extend my thanks for the trophies, you have exceeded my expectations, and the quality is absolutely amazing. The service was great, and I highly recommended my team using your services again in the future. Thanks again for all your help with the awards, the client (and the recipients) loved them. Whenever I need more awards you will be my first port of call. From pitching the concept of our awards to delivery of the finished product, the team at Gaudio were outstanding. They took time to listen and gave us some really different ideas to the normal ‘run of the mill’ awards. We were impressed with the quality of service, delivery times and attention to detail. We wouldn’t hesitate to recommend Gaudio to anyone who wants awards which are truly unique and special. We’re over the moon with the trophies and plaques, thank you! We love the Gaudio experience from start to finish. Everything always runs smoothly and the end result is brilliant. Thank you once again for your support! Everyone was really happy with the work you guys did and I wouldn't hesitate to use you again. I'm already thinking about next year! My client is over the moon with the awards – they look fantastic! I appreciate time was tight so again, thank you for the swift turn around. We are hoping to re-visit with a 3D version next year for these guys so I’ll make sure we plan in enough time for production. Amongst other BBC work we do also cover other award projects for them, so rest assured, I will be contacting you for a quote. I will also recommend you to my colleagues who were also very impressed. Thanks again! Do you have an Award you would like us to quote for? Our design services is free of charge so get in touch.